ReadingBear.org needs your help with Donations to cover the cost of website hosting service and upgrades. Your one-time or monthly-recurring donation will help ensure that ReadingBear continues to be provided for free. THANK YOU! 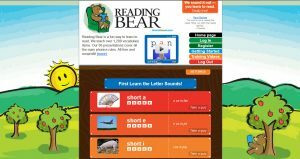 Reading Bear is the first free program online to teach beginning readers vocabulary and concepts while systematically introducing all the main phonetic patterns of written English using innovative rich media in 50 presentations covering phonics principles illustrating over 1,200 vocabulary items. Reading Bear’s Mission is to help early readers learn to read and to date we’ve reached more than one-half million users with an average of over 33,000 users a month. Your Donation of $5 or more to ReadingBear.org will help fund our website upgrade to support more users and will help pay for our steadily increasing website hosting costs – each and every dollar is greatly appreciated. .As part of 501(c)3 non-profit St. Charles Place Education Foundation, ReadingBear.org is the #1 Google ranked Free-Phonic Literacy learn-to-read website.